DJing has taken us many places throughout the years, and a couple weeks ago it took us all the way across the country to Los Angeles, CA. 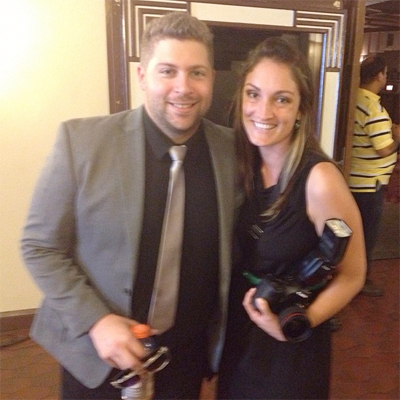 Kyle and Ryan traveled to SoCal to DJ Joy and Frankie’s wedding at the Warner Grand Theatre. Not only was it a beautiful venue, but the sun was out every day but it still felt like spring. We were going to post some photos of the venue, etc. that we took, but it would be way better to just show you the awesome work of their photographer (who’s actually from our area), Tara Peddicord. Check out all of her photos from the wedding. Oh, and here’s a pic of Tara and I right before the wedding guests were about to arrive. Thanks Joy and Frankie for letting us be a part of your big day! !